Do you need a bigger file? The file available on this site is 701 x 1024 px. To obtain an alternate file type or higher resolution copy, please contact the owning institution. Scope/Content: Extensive later-seventeenth-century underscoring, marks, and annotations throughout in both ink and pencil. Also bears the manuscript textual corrections of the translator John Florio (one of six known copies to contain Florio's hand-corrections). 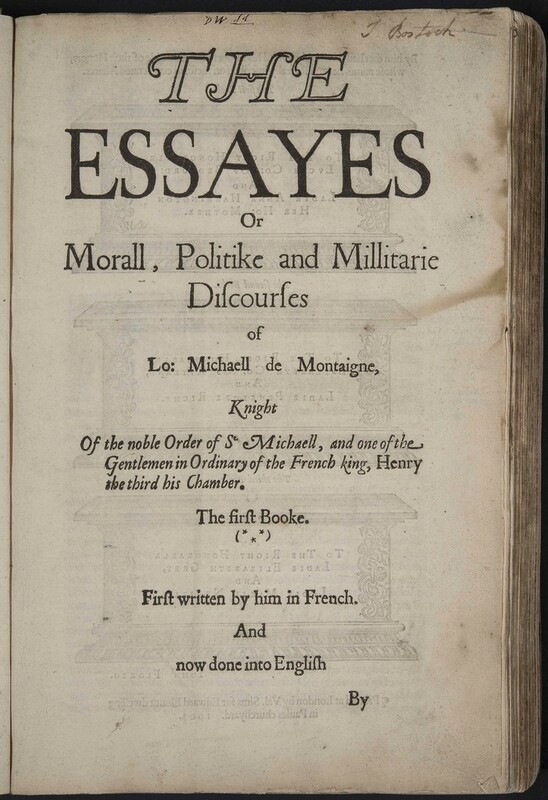 For more on this copy, see William Hamlin, Montaigne's English Journey: Reading the Essays in Shakespeare's Day (Oxford: Oxford University Press, 2014), pp. 229, 245-48. Annotated blank leaves at the end of the volume function as a manuscript index to the printed text, keyed to manuscript marks in the margins, underscoring, and annotations. Scope/Content: The initials "D.W" at head of t.p. with his extensive underscoring and annotations throughout; three blank sheets at end with additional manuscript annotations. Bookplate of John Bostock, M.D. with his ownership inscription at head of t.p. ; also bookplate of George Goyder.